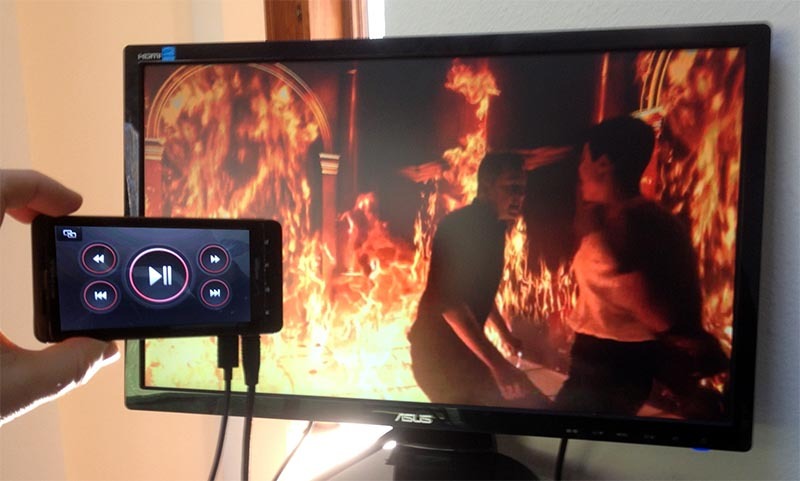 We basically have 2 methods available to achieve video playback from your phone on your TV. The most obvious one is simply get a cable that allows your phone to be connected to your TV. One of the things that bothers me the most about the cable method, besides having to have a weird cable running from your phone to your TV, is that not all phones work the same way when it comes getting video-out to work. Finding the right cable is your first problem, but having your apps actually send a video-out signal appears challenging as well. Note : If you’d like to know more about some of the normal video connectors, see the overview in the “How to Connect your PC to your TV” article. An old Motorola Droid connected to an Asus HDMI monitor. The playback to HDMI however, only works with the media player that came with the phone. A “HDMI” button in the upper left corner allows you to switch to HDMI output and turns your phone-screen to a control panel. Media applications like XBMC on Android unfortunately do not support the output through HDMI on this particular Motorola model. 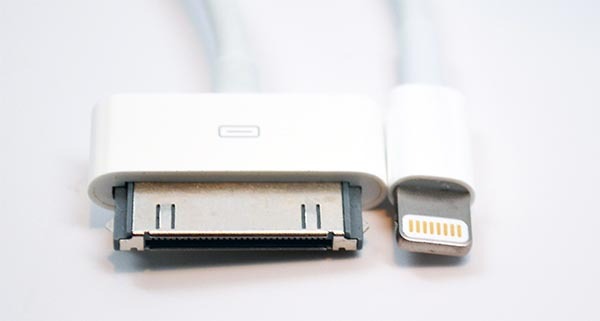 With iOS devices, like iPod, iPad and iPhone, two connectors are currently common: The old 30-pin connector and the new Lightning connector. Video output can be accomplished through these connectors, but not every iOS version and/or App supports video output. Older iOS devices have the option, with the proper dock, to do this for Composite, S-Video, Component Video or even HDMI connections on your TV. Be warned though that such a cable might ot work with your device or the app you have in mind. 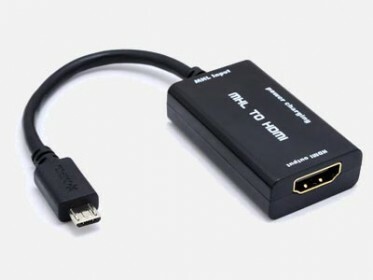 Certain Android devices have HDMI connectivity build in. A few Android phones, for example the Motorola model illustrated earlier, have a micro HDMI connector or have phone specific cables available for video out. Others have the upcoming standard for HDMI output. This upcoming standard, called MHL (Mobile High-definition Link), has extra pins “hidden” in the micro USB port of the phone. So far I have seen nothing but trouble with these cables though, so your milage may vary. I have a device here with a so called 5-pin MHL (standard) connector which will not work with the 11-pin variant (Samsung). Once you’ve grabbed a microscope to identify the differences, you’ll quickly come to the conclusion that at this time (2013) the MHL cables are not something you can count on, let alone find the exact right cable and enable HDMI output. This, if you have the right equipment, is probably the coolest and easiest way to play your cellphone or tablet video’s on your TV. Video files protected with DRM, for example purchased movies, often do not work with this type of setup. The main reason for this is that the device that is playing the video file, does not have the proper software and/or keys to decrypt the file. To play these files, you’ll need to remove the DRM protection of the file. With both methods we will mention below, the principle is based on “sharing” a video file on your Cellphone or Tablet with your TV or Media Playback device. Think of it as your phone offering files on your network, like you might have seen with your Windows computer that shares files over the network. The device that is accessing your phone or tablet is the device that handles the actual playback. So basically the TV (for example) copies the file from your phone to itself, and then plays the copied file by itself. This in contrast to using a cable, where your Cellphone or Tablet is the device that handles the actual playback and pushes a video signal to your TV. Note : The device (TV) that plays the file is not really first copying the entire file, it’s rather playing the file while it’s “copying” (ie. streaming). After explaining these 2 methods, we will show you how to use an app called iMediaShare that supports both methods for Android and iOS. 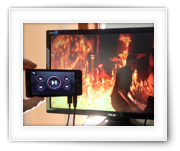 Note : Another alternative to DLNA or AirPlay would be Miracast, which is supposed to be much easier in use, however Miracast only works via WiFi-Direct and will not work through your home network. DLNA is a industry-wide standard for sharing data over a network, mostly geared towards streaming media like videos, photos and music. It is an open standard and a consortium of manufacturers have been working on it since 2003, with Sony being one of the main players. In a DLNA setup, we will see a DLNA Server, which provides content, and one or more DLNA Clients which play digital content stored on a DLNA server. A DLNA server can for example run on your computer, or even a NAS (Network Attached Storage), with software that can be downloaded for free (Twonky Server or PS3 Media Server). In our example here, your cellphone or tablet will function as a DLNA Server. When it comes to a DLNA client, you’ll typically will be looking at a device capable of content playback. Note : Obviously AppleTV does not support DLNA. Note : The App we will be using later on, will identify the DLNA Push-to-Play automatically. When we want to watch a movie for example, we can initiate video playback in two ways, depending on the capabilities of your DLNA server and client of course. The classical method is to have the client pull the desired content from the server. This means that form your playback device, the DLNA client, you select what movie from the DLNA server you’d like to watch. More advanced devices have the option to have the server actually push the content to the DLNA client. Which is called Push-to-Play, a method we will prefer in our Cellphone setup. In such a case you select the movie you’d like to see on your cellphone, the DLNA server, which then is being pushed to the playback device (DLNA client). Not every DLNA device is necessarily DLNA certified, although they might work just fine. Not all DLNA devices supports Push-to-Play. For some devices, the DLNA capability is not even mentioned in the manual. During the tests I have done with several devices, I’ve noticed that video files in MP4 format, M4A or MP3 music and JPEG pictures are the most commonly supported formats. I did find that most AVI files will worked well, but none of the MKV files will work (you’ll need to convert those with for example HandBrake for Windows, MacOS X, or Linux where the source will be the MKV file and not a DVD of course). AirPlay – Apple only …? Of course Apple will do anything to remain non-compliant with the rest of the world and uses their own method: AirPlay. 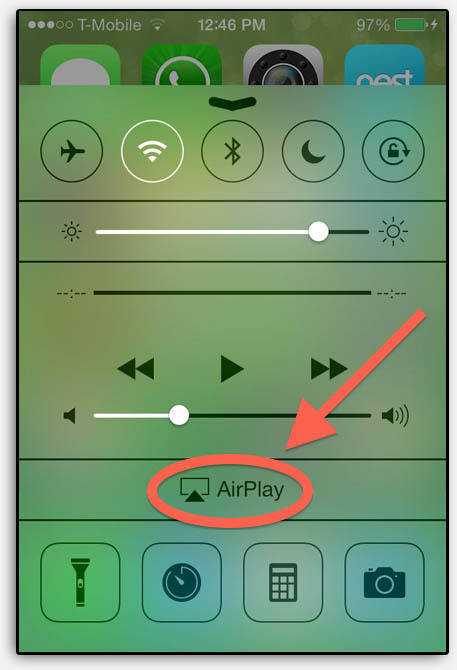 AirPlay could be seen as the successor or AirTunes, which allowed streaming audio only, and is not DLNA compatible. Apple however has licensed their proprietary protocol to third parties. Even though AirPlay is less widely available than DLNA, you might be able to find another device that actually supports AirPlay. AirPlay works in a similar way as DLNA, and was initially geared towards Apple hardware like iPhone, iPod, iPad and AppleTV. Unlike DLNA, AirPlay always supports Push-to-Play, so playback pushed by the “server” will work with any AirPlay compatible devices that allows playback like another iTunes or AppleTV … this excludes devices like your iPhone or iPad. Most Apple devices are capable to be a AirPlay Server – ie. the device providing the content. This includes your iPhone, iPad and even iTunes on your computer. When it comes to clients, you’ll be a little bit more limited. Typically clients, the device that do the actual playback, are your computer (iTunes) and an AppleTV. Some non-Apple devices seem to support being an AirPlay client as well, although they often only support Audio. XBMC for example does support AirPlay, be it somewhat limited. 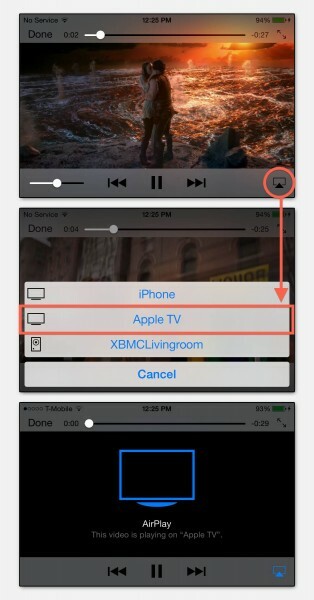 Apple devices will only see XBMC (for now) as an Audio only device. The iMediaShare app, which we will discuss later, however does allow Audio and Video to an AirPlay device like XBMC and AppleTV. iTunes, if needed, can be used as an AirPlay server as well. In the picture below, you’ll see the typically AirPlay icon/logo highlighted. For the use with AirPlay a simple rule can be followed. Anything that can be played with your default apps (so not 3rd party apps!) will be supported by AirPlay. The most common formats are MP4 for video, M4A for music, and JPEG or PNG for photos or pictures. For video playback from your iPhone or iPad to your AppleTV, no extra apps need to be installed. Note : Before starting playback make sure that the destination device, like an AppleTV, is up and running. If you fail to do this, your iPhone, iPad, or iTunes will not recognize it as such. To start simply go to your “Videos” and start playback of your video. Tap the AirPlay icon and select your destination device and you’ll see your TV screen change and play the movie or video. Note : If you picked XBMC as a destination, then you’ll notice that it will only play the audio part. 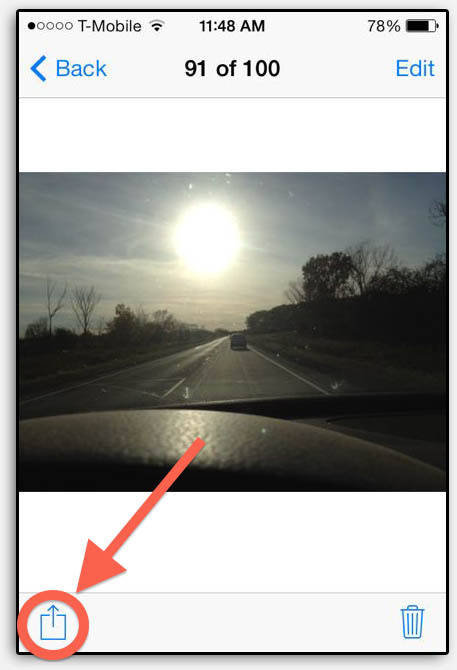 You can also display the pictures and video recordings from your camera roll this way, where you’ll first have to tap the “Share” icon. 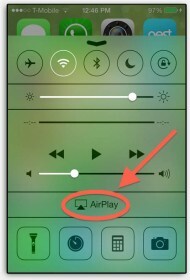 For music, you’ll have to pull up the music controls, under which you’ll find the AirPlay icon as well. I can highly recommend iMediaShare, it’s not only easy and solid, it also supports DLNA Push-to-Play, Regular DLNA and AirPlay, so there is a pretty good chance that you’ll find a capable device in your home it works with. If you only want to use a DLNA variant, then Samsung owners could probably try AllShare first if it’s preinstalled on your device. I have however received reports that AllShare isn’t always that good with larger (1080p) files. iMediaShare can be downloaded in a personal version at Google Play, here is the link: Google Play iMediaShare Personal. There used to be a premium version, capable of HD video, but it has been replaced with a totally useless successor called FLIPPS. You maybe be able to find an older installation file (APK) if you use Google. I did find an older version, which you can download from Tweaking4All, but you’ll have to go to “Settings” and allow applications from unverified sources. Keep in mind : it’s always better to get the latest version from the website of the developer or through Google Play. iMediaShare Personal also exists for iOS and can be found at the iMediaShare Personal iTunes page. Apps are not allowed to share video files that are not located in your photo albums. You can use the Camera Connection Trick to transfer videos into your photo albums. Sync with iTunes after you’ve copied the movie in your “Pictures” folder and have set the photo sync options to the “Pictures” folder and have “Include Videos” checked. 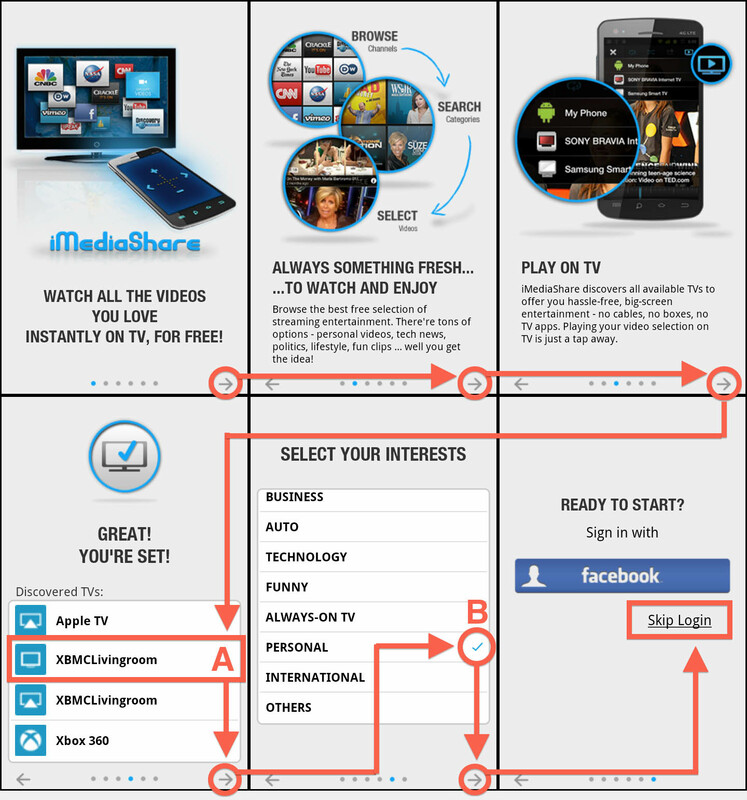 When you start iMediaShare for the first time however, you’ll have to go through a few initial steps – nothing big though. Below the 6 screens you’ll have to go through. Before proceeding, you might want to turn on all TV’s, Game Consoles, and Media Players that you have, so you will get an idea of what devices in your home can be used for this purpose. In the 4th screen (A) you’ll see a list of capable DLNA and Airplay devices found by iMediaShare. In our example list your see my AppleTV (AirPlay), XBMCLivingroom (twice: once for DLNA and once for AirPlay) and my Xbox 360 – all the devices I currently have available for wireless video playback from my cellphone or tablet. Whatever device you pick here – you can change your selection later. On the 5th screen (B) you might want to pay attention. My preference is to remove the checkmark behind all options except the “Personal” category. The “Personal” category involves your videos, photo’s and pictures! All other categories are online (Internet) content. Personally I’m not a fan of having everything connected to Facebook and thank goodness you can click “Skip Login” so this will not be tied to your Facebook account. I have noticed however that iMediaShare sets up a real DLNA server, so a TV that can handle regular DLNA will be able to see this “server” in your network and even allows you browse the movies, pictures and music on your cellphone or tablet. The downside is of course that you’ll need to browse on your TV to find the movie you’d like to watch. Now that every thing is “set”, time to start playback. Screen 1 is the first screen you’ll see after the blue start screen, or after completing step 2. Here we select the source of our video, photos or music. iMediaShare supports a lot of web resources and even your own media servers in your local network, but for our purpose, playback of media from our phone, we will have to look under the PERSONAL heading. Screen 2 will show us what’s on our cellphone or tablet, and in the example below it only shows our SD-card (“external_sd” which might be named differently on your phone or tablet). Tab the video you like, or like I did: select the SD-card. Screen 3 only shows for the SD card example where we can select a video file which will be opened right away. 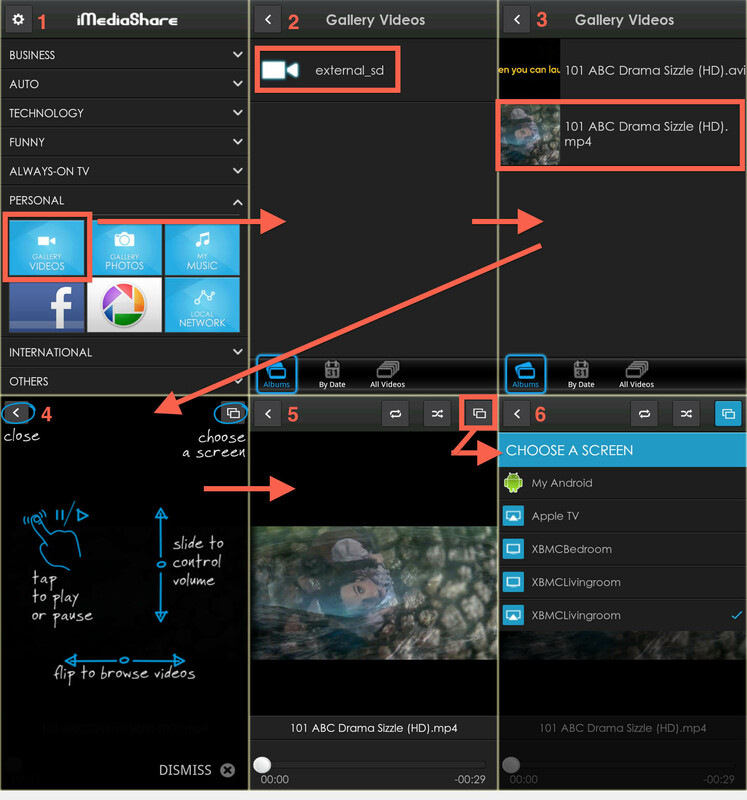 Screen 5 is what you’ll see during playback, where the controls demonstrated in Screen 4 will work. Screen 6 is where we can change Playback to a different device. There are 13 comments. You can read them below. The easiest way would be by using HandBrake (free) – Tweaking4All has guides available for Windows, MacOS X and Linux. When following these guides, select the MKV of FLV file you’d like to convert as the source (instead of the described DVD). I did find that setting a constant bitrate of say 1200 – 1500 gives pretty good results. On most modern computers conversion should be quite fast. One thing worth to mention is that AirPlay supports only stereo sound (no 5.1CH or more). I was unaware that AirPlay did not support 5.1, but it kind-a does make sense since it’s not performing all that stellar to begin with … good to know! AirPlay is a “product” from Apple and comes free with MacOS and iOS. Keep in mind though that not all functionality works in all directions. For example, to do Airplay from iOS to an AppleTV works, however Airplay from an iOS device to a Mac doesn’t work out of the box. For some of these extra functions you might need to look into 3rd party applications. However, … for playback of iOS videos (for example) on your TV, you’d need a device connected to your TV that can receive AirPlay. This could be an AppleTV, … or look at this article showing a few examples. Keep in mind that not all AirPlay capable devices can handle video. CNet (not my favorite) has an Airplay guide that might be helpful as well. I downloaded Imelda.. version I got was 4.1. I went to their site but was directed to goo.play. I did not get any of the screens you mention.straight the f panes mentioning video. photos music.etc. settings shows only FB log in log out. how to get the APK u mentioned. I’m apologize for not quite understanding what you’re asking. I assume you’re phone/device is Android … and what are you trying to do? Which steps? Not sure what Imelda is …? I think you might have meant iMediaShare? Your can download (and old version) from the green download box in the article. yes my phone is mi S3 android. I tried the link in the article…no luck. takes me to g.play and same version of imediashare is available. I am trying to connect my sharp LCD with anycast dongle switched to DLNA mode. THE mobile only shows photos on phone. there are no videos stored on phone. but can’t see even photos on TV. nor can I connect to any network. for films it says download Flipps ap. would like networks and films not from from Torrent but other sources. Look just below “iMediaShare – The App that does it all … “, you’ll see a green download box, where you can download the APK directly from Tweaking4All. That is the APK I used, and it should work just fine. I have to admit though that I do not have a modern Android at my disposal anymore for testing. It is an older version, but that’s the one I used for this article. this is for your info. thanks for your prompt responses. Cool! Let us know how that versions works for you.